My wife and I have been married just shy of twenty-five years. Amazingly, there is no sense of boredom or regret. Rather the opposite is true. We are friends and companions who look forward to spending time together. Yesterday when I arrived home from work, this little sentiment was waiting for me, as well as a garage door popped open so I didn't have to fumble for my key to pull the motorcycle in. This is one example of what love looks like. 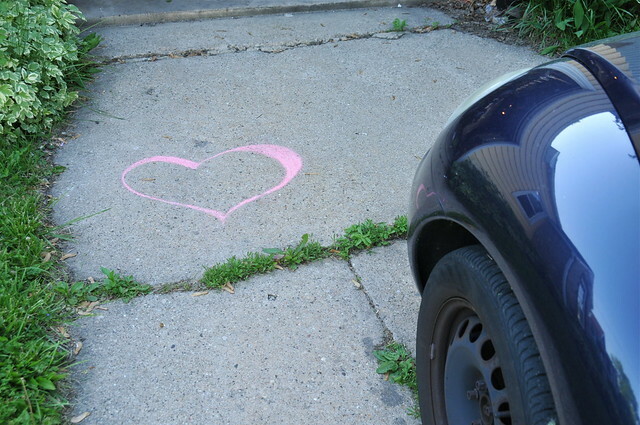 After all these years, she still felt the desire to chalk a heart to greet me. And after all these years, I laughed with delight and fell in love, again, a little bit more.